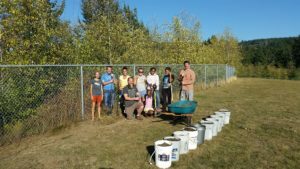 Northern Heights Elementary school garden was established in September 2017, with support from Common Threads. Over the course of just one year the garden classroom has gone from just a few raised beds, to a collection of thriving garden filled with a variety of edible roots, stems, leaves, and flowers, a berry patch brimming with strawberries and raspberries, and a functioning compost system. The long-term goal for the garden includes a shed, sheltered outdoor classroom, greenhouse, and more. Luckily, our school garden is not only the pride of our students, but the teachers, families, and PTA as well! Northern Heights Elementary has 290 square feet of growing space. It is located at 4000 Magrath Road, Bellingham WA 98226-1729. If you’re interested in getting involved,Northern Heights Elementary has a Common Threads Facebook Group that you can join!